SOME FIN REMARKABLE: It is the first documented sighting of the predator in Spain for 30 years. A GIANT great white shark has been spotted off the coast of Mallorca. The five-metre long predator was filmed for 70 minutes as it cruised in clear water in the Cabrera Archipelago National Park, 10 kilometres to the south of the holiday island. 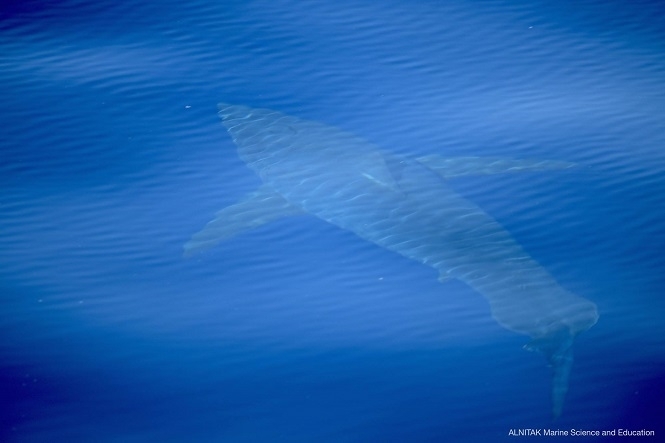 Biologists from the ALNITAK 2018 Scientific Expedition announced the historic sighting on their Facebook page, writing that it is the first time one of the huge fish, known scientifically as Carcharodon carcharias, has been spotted in Spanish waters for three decades. Led by Spanish-Dutch biologist Ricardo Sagarminaga van Buiten, the team also included 16-year-old scholarship students Miguel Felix Arboledas and Nahim Lasgaa Capo, plus British environmentalist and writer Georgina Stevens. Alnitak is a Spanish marine research and education centre dedicated to the conservation of marine habitats, and the landmark observation came as the organisation’s Töftevaag research vessel carried out a deep water survey around the Cabrera islands marine reserve. There are at least 47 species of shark in the Mediterranean, but attacks on humans are extremely rare, with even fewer fatalities. Next articleCould you dogsit for Mocha?